It’s been warming to the soul to discover I have fellow garden junk lovers out there. I knew you were out there, but it’s good to connect. Let me share an old favorite DIY project. These old silverware windchimes were flying around the arts and craft fairs about 10 or so years ago and even though they are not really on trend any longer, I still love them. They have a unique kitschy look and a very cool sound. 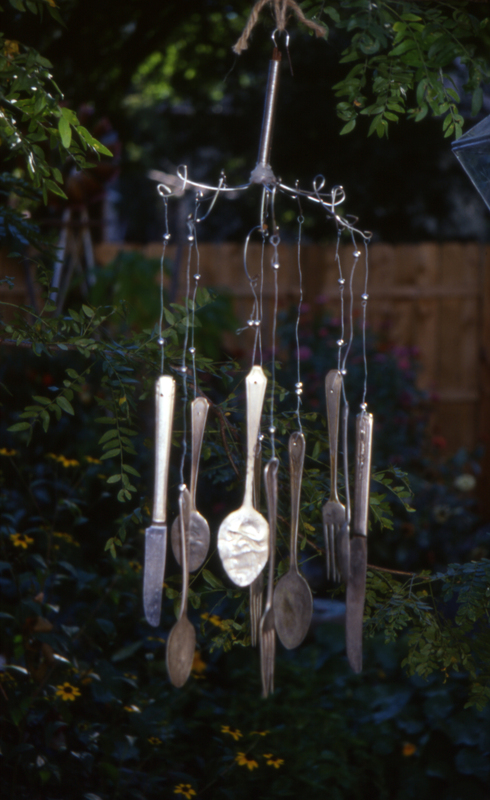 These kitschy, vintage silverware windchimes are fun and easy to make. Search thrift stores, yard sales and flea markets for vintage pieces of silverware. Generally speaking, this is the approach to making your own. Begin with a wire whisk, the type with a wire handle and loop at the end. This will be the foundation of your wind chimes. The loop at the end of the handle is what you will use to hang your chimes. Snip the loops of the whisk with a needle-nosed pliers, twist a loop at the center and end of each length of newly created wire. You will hang the pieces of silverware from the loops. The number of silverware pieces you will use depends upon the number of lengths of wire you have after cutting the loops. Use a mixture of forks, knives, tablespoons, and teaspoons. Wearing safety glasses and using a standard hammer, pound the pieces of silverware flat. This will be easier than you think. Drill holes into the ends of the handles of the silverware, using a 1/16 inch bit. At this point, it is helpful to somehow hang the whisk up while working. Using thin wire, 30 gauge or so, tie a 24 inch piece of wire to each piece of silverware, much like you would using a piece of string. Consider, tying metal beads into the length of string, for decoration. Attach each wire to the loops you created at the end of each length of wire on the whisk, varying the lengths for visual interest. The flattened tablespoons will do an effective job of catching the breeze and propelling the chimes into motion. Hang and enjoy the sight and sound of your kitschy and homespun piece of art. These windchimes are made by screwing eye hooks into the bottom of a store-bought birdhouse and attaching varying lengths of copper piping. Many coats of polyurethane seal the house and protect it from the elements. Varying lengths of copper tubing hang from the bottom of a store-bought birdhouse to make this set of chimes that is friendly to the ears and the birds. Small metal eye-hooks are screwed into the bottom to hold the tubes. Holes are drilled into the ends of the tubes and they are then wired to the eye-hooks. A wood ball is suspended by wire down the center of the pipes from a hook. A metal spatula, flattened and textured with a hammer, hangs at the end of the center wire to catch the wind and set the ball swinging and the pipes into motion. Leftover bits of paint from household projects were used on the birdhouse and the wooden ball. However you finish your birdhouse, end with multiple coats of polyurethane to protect your new creation from the rain. These are great! The silverware chimes is a future project for sure! I have been collecting silverware for years just for this project. I just did’nt have directions how to make them. Happy day(or night). Thank you so so much. I just Love “Funky Junk. Thanks Eric! I’ve always loved these-your directions make this a totally “do-able” project! We had the kids at club camp make these. Everyone enjoyed the craft and they sound lovely.